Welcome to Bunny.nu » Blog Archive » Buttons is on a date! Buttons is on a date! Buttons at Little Fluffy Adventures is on a date! We keep our paws crossed that eveything works out fine! This entry was posted on Thursday, May 10th, 2012 at 7:08 am	and is filed under Bunnies. You can follow any responses to this entry through the RSS 2.0 feed. You can leave a response, or trackback from your own site. They look wonderful together, I really hope this will be true love so Buttons get a new girlfriend! Thanks for posting about Buttons. 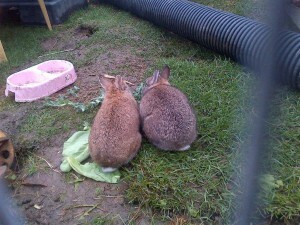 We are all very excited as our friends at the rescue say that Buttons and the girl are getting along brilliantly! Yippee!